For this giggly baby, the gift of better sight isn't just necessary, it's a whole lot of fun. Your holiday lights might be impressive, but are they set to music? Watch and be wowed. 3 Rivers would like to thank the more than 1,100 loyal customers who participated in our annual Customer Satisfaction Survey in October! We take your responses seriously and the feedback provided will help us make improvements to our service and provide and develop the telecommunications products you need to take part in the fast-moving, technology-driven world we live in. As an incentive to answer the survey, we promised to draw nine participants' names at random to receive prizes ranging from $50 Visa Gift Cards to an iPad. Winners were picked from Norris, Sheridan, Brady, Heart Butte, Twin Bridges, Sheridan, Shelby (two winners!) and Ennis. Thanks again! Download this holiday app to turn yourself and friends into elves, then share the fun dancing elf videos on social media. Ready to escape the winter blahs? Download this app and get great deals on super-cheap flights and hotels all over the world. Everyone can use a bit of inspiration now and then - even better, every day! Use this app to get your daily dose of positivity. turbotax.intuit.com – Along with the holidays comes end-of-year financial planning. Head to this site before December 31 to learn how to minimize your 2017 tax bill. Suggestions include taking last-minute deductions (like holiday charitable donations), selling certain investments, contributing to retirement accounts, checking IRA distributions, and watching your flexible spending accounts. foodnetwork.com – Leave it to Food Network to spoil cookie lovers with 109 great recipes for the holiday season. Find all your favorites — like Gingerbread, Shortbread, Butter, Sugar, and Spoon — along with some unusual picks like Crunchy Peanut Butter S'more Bites, Cinnamon-Spiced Hot Chocolate, or Turtle Graham Bars. Yum! 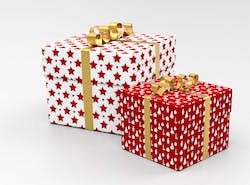 countryliving.com – After picking out the perfect gifts for your loved ones this season, don't forget to dress them up with fun wrapping. This site offers many whimsical ideas to reflect anyone's tastes — including artistic, musical, maps, ornaments, bright colors, crosswords, chalkboard, or simple but elegant brown paper. doughroller.net – If holiday spending has put an unpleasant dent in your finances, visit this site to iron it out. Read articles on a variety of money topics; learn about the best credit cards and checking and savings accounts; and visit the Tools section for help with investing, budgeting, debt, and more. Short Tutorial/FAQ – How Do I Use Hashtags On Facebook?